We study capacity disruption and recovery policy impacts on supply chain (SC) performance. Discrete event simulation methodology is used for analysis with real company data and real disruptions. Two novel findings are shown. First, disruption-driven changes in SC behaviour may result in backlog and delayed orders, the accumulation of which in the post-disruption period we call ‘disruption tails’. A transition of these residues into the post-disruption period causes the post-disruption SC instability, resulting in further delivery delays and non-recovery of SC performance. Second, a smooth transition from the contingency policy through a special ‘revival policy’ to the normal operation mode allows the negative effects of the disruption tails to be partially mitigated. These results suggest three managerial insights. First, contingency policies need to be applied during the disruption period to avoid disruption tails. Second, recovery policies need to be extended towards an integrated consideration of both disruption and the post-disruption periods. Third, revival policies need to be developed for the transition from the contingency to the disruption-free operation mode. A revival policy intends to mitigate the negative impact of the disruption tails and stabilize the SC control policies and performance. The experimental results suggest the revival policy should be included in the SC resilience framework if the performance cannot be recovered fully after the capacity recovery. Two-stage, multi-period SC planning with multiple constraints on production capacity, setups, shipments and inventory control is the object under investigation. A two-product system with independent seasonal stochastic demand with high variability is analysed. The planning horizon is 7 weeks. Production planning decisions include inventory dynamics at the DC. We consider both product availability and ‘freshness’ level requirements in service levels although customers are segmented according to their freshness requirements. The fixed parameters include minimum order size and inventory level at DCs, minimum production batch size, queue size limits, setup time, production capacity, wastage, inventory holding, production, setup and transportation costs. Also included are the mean demand and its standard deviation, shelf life and freshness threshold, production order allocation interval, penalties, mean and standard deviation of time duration and interval of capacity breakdown, and the remaining capacity percentage after the disruption. Production constraints include minimum lot size, maximum capacity and setup time. Inventory constraints are comprised of minimum inventory levels (i.e. reorder point expressed in days of supply availability) and minimum order size. Outbound deliveries from distribution centres follow the FEFO rule. A continuous review system with fixed order quantity and pull production strategy is considered. The objective is to minimize total system costs while maintaining the required service level. Total costs are computed as a sum of total holding costs, transportation costs, write-off costs, penalty costs and manufacturing costs (Eq. 1). Unit inventory holding costs ch and transportation costs ctr are used to compute total costs. In a case of inventory with expired date yw, write-off costs increase proportionally to the purchasing prices p. If the customer order size exceeds the inventory at DC, a penalty u is applied. Manufacturing costs depend on the number of setup and fixed costs for capacity units, cfix. Service level is calculated as a ratio of products shipped divided by products ordered with no backlogging within model period. SC performance is therefore measured with the help of total costs and service level. Total cost metrics are comprised of inventory holding costs at the DCs, write-off costs, transportation costs, production costs and penalties. Holding costs are computed subject to interest rates. Write-off costs are computed based on the product costs. Transportation costs depend on the distance, order quantity and shipment tariff. Production costs include fixed equipment-related costs (proportional to the capacity units) and setup costs. Penalties are applied if the order size from the key customer exceeds the available delivery quantity. Service level is computed as a ratio of the delivered and ordered products. According to Eq. (2), production capacity can be reduced by a disruption coefficient ξ. By default, the following parameters are used: mean interval is 100 periods and mean duration of disruption is 20 periods. Standard deviations are 50 and 10 periods, respectively. At the end of the disruption period, the capacity K returns to normal. Equation (3) sets the constraint on minimum service level. In the considered practical case, 98.5% has been used as the reference value for minimum service level. Equations (4) and (5) define maximum queue lengths in the production system. According to Eq. (6), production quantity can equal or exceed minimum batch size. Equations (4)–(6) define the rules for production setups. Equations (7) and (8) are binary and non-negativity constraints on the reorder point for products i and j.
Empirical data revealed the average weekly demand of 2,500 units. The basic demand in the model is 2,541 units multiplied by the seasonal factor. The period demand dr is therefore defined according to Eq. (9). Demand is divided into two customer groups, i.e. \( \alpha \) customers have higher priority than \( \beta \) customers. Demand share of \( \alpha \) customers is defined by parameter \( \nu \) according to Eq. (11). The algorithm described above allows for consideration of both inventory dynamics and expected shelf life of future deliveries. The experiments have been performed on the following parameter setting (Table A1). The experiments have been performed with the following parameters (Table A2). 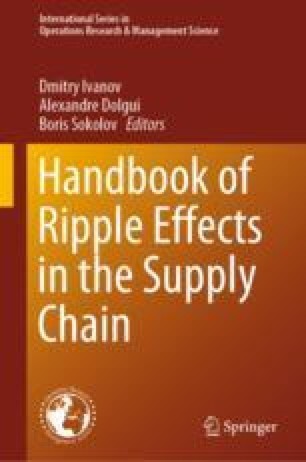 Sawik, T. (2018) Two-period vs. multi-period model for supply chain disruption management. International Journal of Production Research. https://doi.org/10.1080/00207543.2018.1504246.